/EINPresswire.com/ -- NEW YORK, NY--(Marketwired - May 17, 2017) - In response to a public outcry, Blue Man Group and YouTube® sensations The Slow Mo Guys, finally joined forces -- they went bowling. 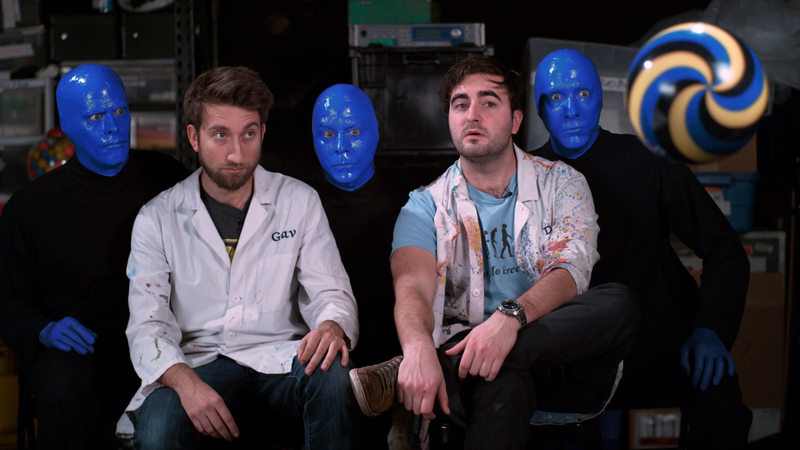 "Whenever we set out to create a new video or new piece of content for the show, we tend to let the Blue Man character guide us," said Doug Baldinger, vice president of creative at Blue Man Productions. "Where his curiosity goes, we follow. In this case, he felt like going bowling." 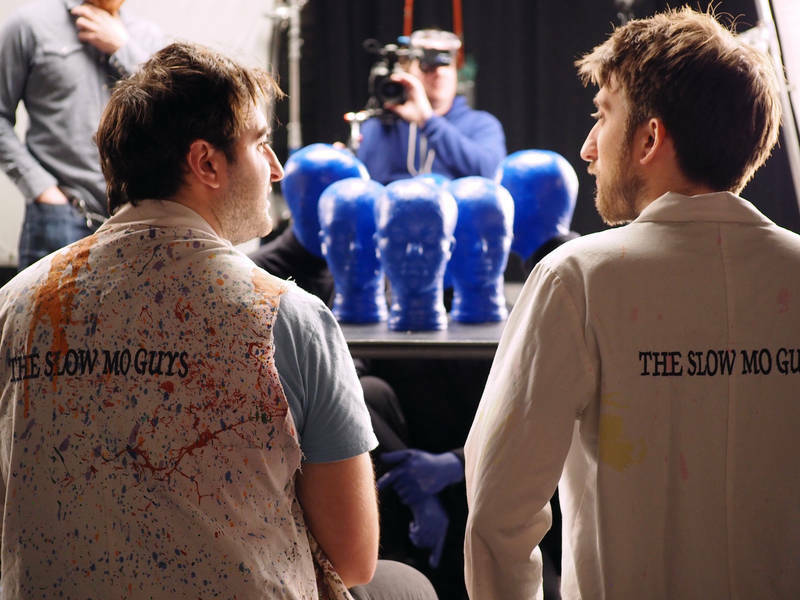 To capture the unorthodox bowling session in slow motion, the talents and aesthetics of Gavin Free and Dan Gruchy (aka The Slow Mo Guys) were a perfect fit. In their new video, The Slow Mo Guys teamed up with the bald and blue trio for a day of experiments in their New York City lab. Together they explored the beautiful destruction that ensues when a 16-pound bowling ball drops from the ceiling, or launches from a 15-foot custom-built speed ramp. The fate of jello molds, colorful candy jars, paint-filled martini glasses and more can be viewed at 10,000 frames per second in stunning 4K resolution. The Slow Mo Guys established an award-winning YouTube channel that creates innovative videos capturing various activities in slow motion. They utilize a $150,000 high-speed camera to capture over 343,000 frames per second. Past videos captured in slow motion include a six-foot rocket shooting off into the sky, exploding batteries and a person jumping on a giant six-foot water balloon. Their YouTube Channel has over 9 million subscribers and over 1 billion video views. "The Slow Mo Guys and Blue Man Group share a lot of the same DNA," said Chris Naka, creative director at Blue Man Productions. "We're fascinated by the same things... paint, sound visualization, mess making... and we take a similar DIY-scientific approach to our work, so getting together was a dream come true. " For more information or to purchase tickets to a show, please visit blueman.com or call 1.800.blueman. Fans may keep up with Blue Man Group through Twitter, Facebook, Instagram and Snapchat at @bluemangroup or the hashtag #DareToLive. Blue Man Productions is a global entertainment company best known for the award-winning Blue Man Group show, performed in over 20 countries and seen by more than 35 million people worldwide since 1991. A dynamic combination of art, music, comedy and technology, the show's euphoric celebration of human connection has universal appeal for a broad range of age groups and cultural backgrounds. The show is continually refreshed with new music, fresh stories, custom instruments and state-of-the-art technology. Blue Man Group has permanent theatrical productions in New York, Las Vegas, Boston, Chicago, Orlando, Berlin and a World Tour. This creative collective has become part of the pop culture zeitgeist. Blue Man Group has served as the face of branding campaigns for Intel and TIM/Brasil and appeared countless times on hit shows like "The Tonight Show," "Arrested Development," "Ellen," "Schlag den Raab" (Germany), "WOWOW" (Japan), and "Caldeira~o do Huck" (Brasil). Beyond the stage show, they are Grammy-nominated recording artists, known for their contributions to various film and TV scores and multiple Blue Man Group albums, including their most recent, THREE. Their "Megastar World Tour" rock concert parody played arenas across the globe. The group's recently published first-ever book, Blue Man World, is a visually stunning anthropological exploration of the curious bald and blue character.